Field recordings made in Europe by Geert Vermeire (curator of sound festivals and workshops new media) and Stefaan van Biesen/the Milena principle. Sound compositions, mixing and production by Stefaan van Biesen (member of the electro Indie rock band China Blue: http://www.chinablue.be). [Ghost Conference] Bunkier Sztuki [Museum gallery] in Krakow Poland, on Saturday 16.06.2018. Ghost Conference is a multi-channel sound installation consisting of a music/auditive compositional layer, a vocal and soundscape storytelling layer [stories told by physical or metaphorical refugees and migrants from all over the world], a textual layer [spoken live or recorded by narrators], a techno-philosophical layer [told by humans or robots]. The basic assumption of the work is a radical rejection of any hypostatic and monumental definition of identity [national, religious, traditional]. Ghost Conference materialises in a virtual venue, where internet and telephone infrastructures provide the new sensorial organism to manifest its phenomena and co-extension in one and multiple places. In practice, the idea is to have all the participants connecting with us through various means of electronic communications ways [Skype, telephone, Jitsi, Whatsapp etc.] and speak to us and to our audience about given set of topics. The topics for the first event would circulate around the theme of migration [in a very broad sense], space availability, co-existence and/or disappearance of materiality. The event will take place in Bunkier Sztuki gallery in Krakow, on Saturday June 16th, between 3pm and 7pm. Ghost Conference. Together with Marcin Barski (sound-artist/music curator), Lorenzo Brusci (composer, inventor) and with a support of Bunkier Sztuki Art Gallery. Afour-hour-long live-processed global sound-text composition based on materials provided by contributors from all around the world. We are grateful for their wonderful contributions and we'd like to thank each of them. Thank you so much Andreja Andric, Michel Banabila, Ess Beck, Michael Begg, Burkhard Beins, Stefaan van Biesen, Alessandro Bosetti, Yury Bulka, Luca Canciello, Francesco Capann, Alfredo Costa Monteiro, Patryk Daszkiewicz, Sandra Fruehbing, Charles III Goff, Paweł Górecki, Oriana Hadad, Thomas Harzem, Bogna Juchnowicz, Aleksandra Klimczak, Monika Konrad, Matthias Kranebitter, Joseph Kudirka, Michał Libera, Artur Lis, Aleksandra Łukaszewicz Alcaraz, Svetlana Maras, Claudia Mel, Antoni Michnik, Chrysti Mouratidou, Olia Olina, Dominika Peszko, Antonella Radicchi, Kamil Radomski, Sara Rodowicz-Slusarczyk, Paul Roth, Adam Rzepecki, Jacek Smolicki, Kat Steih, Jarek Tochowicz, Ada Valeria, Geert Vermeire, Sławomir Wojciechowski, Yoshi Yubai, Rafilid Zacharoula, Kacper Ziemianin. Electro acoustic sound composition with field recordings & Keyboards. Composed, mixed and production : Stefaan van Biesen. [Philocthetes] sound compositions for theater play, Athens Greece 2016. Directed by Sissy Papathanassiou, Athens Greece 2016. Electro acoustic sound composition with field recordings. Composed, mixed and production : Stefaan van Biesen. [Breathe, Inhale the City] Neme Arts Centre Limassol Cyprus 2017. A score for Marielys Lely Burgos. Performance at NeMe Arts Centre Limassol Cyprus 04.02.2017. Electro acoustic sound composition 'Breathe, inhale the city' 12' remix. Electro acoustic sound composition with field recordings. Composed, mixed and production : Stefaan van Biesen 2017. [Breathe:Inhale the City] Electronic score for Marielys Lely Burgos [New York/Costa Rica/Athens] at NeMe Limassol 2017. [Fly Ways] soundscape for installation Art Borgloon 2012 & Passages La Romiue 2016. [Fly Ways] ISSC 2016 International Conference : The Logics of Image Santorini 2016. [En balade avec Rimbô] Media walk & sound compositions La Romieu France April 2017. A new made media walk and sound compositions. 'En Balade avec Rimbô' in La Romieu France is based on texts written by Christian Porré [Le Bouc Qui Zouke]. A reflection on the life of the poet Arthur Rimbau. The theme is the cat Rimbô. The sound walk is made by the Milena principle [Geert Vermeire, Stefaan van Biesen and Annemie Mestdagh] together with the art oganisation Le Bouc Qui Zouke [Christian Porré, Belinda Porrré and Laurence Fremeau]. [Philocthetes] travelling theater play in Europe 2016. Sound compositions for theater play, directed by Sissy Papathanassiou, Athens Greece 2016. 5 new sound compositions for the travelling teather play 'Philocthetes' by Stefaan van Biesen. 1. Ouverture - 2. Dog Island - 3. Bird Island - Wind & Sea - 4. Crowded City - 5. The Battle. In poem "Philoctetes" by Yannis Ritsos the hero Philoktetes does not speak. Speaks only the young man Neoptolemus. And he talks about betrayal, abandonment, exploitation, political responsibility, childhood, memory and the trauma. Subject of the Greek poet Yannis Ritsos' long poem "Philoctetes" (1963–1965), a monologue in which the youth Neoptolemus convinces Philoctetes to follow him back to the war that will be won by the ruse of the Trojan Horse. Director Sissy Papathanassiou is Ph.D., Theatrologist. She was born in Agrinion, Greece. Studies in Greece: 1987: Degree in Law, Aristotelio University of Thessaloniki 1983 - 1987: Theatre Studies, Theatre School of the National Theatre of Northern Greece Postgraduate studies in France: 1992-1995: - Masters Degree in Social Anthropology - History and Civilisations, Ecole des Hautes Etudes en Sciences Sociales, Paris - Masters Degree in Theatre - Arts du Spectacle, Institut d'Etudes Theatrales, Paris - Sorbonne III, under the supervision of Pierre-Vidal Naquet and Monique Borie-Banu respectively - Ph. D. Arts du Spectacle, Institut d'Etudes Theatrales, Paris -Sorbonne III-NANTERRE, under the supervision of Robert Abirached. [Fly Ways] ISSC 2016 - International Conference : The Logics of Image 2016. Santorini Arts Factory Greece 2016. Becoming Invisible TAF [The Art Foundation] Metasitu Athens Greece 6 April 2016. As part of the AKOO-O/ With Your Consent Exhibition we invite all people to walk with us and "become invisible/following"
Becoming invisible / "following?" : walking - hearing-sensing Spaces/Others is a participatory invitation to engage/inhabit public spaces and their dynamics. 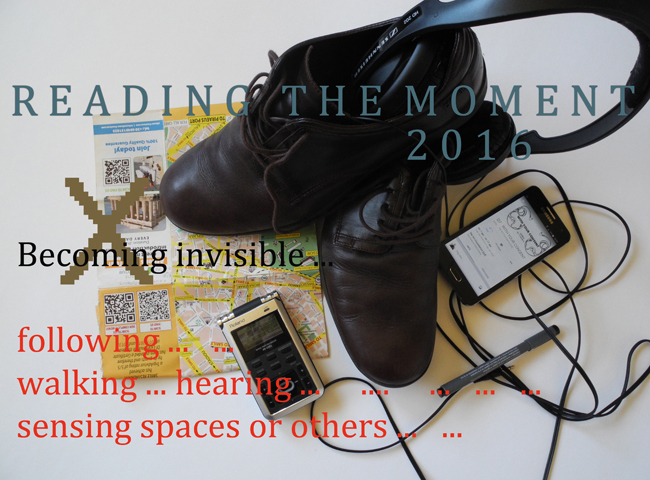 It is encompassed within 'Reading the Moment', an ongoing performative dialogue of sensing urban landscapes in Athens through attention, movement & memory. Participants will have the opportunity to record parts of the walking/observing. Date: Wednesday April 6th, 2016. First walk at 10 am - 12 am. Second walk at 4pm - 6 pm. Meeting Point: The Art Foundation (TAF). Normanou 5, Athina 105 55. Stefaan van Biesen, Geert Vermeire and Marielys Burgos. [Hythlodaeus 2015 - Utopia Sound Map] Cities and Memory ⋈ Oxford UK 2015. Soundscape 'Hythlodaeus 2015': texts 'Unfolding the City' by Geert Vermeire, 'Siren' by Stefaan van Biesen. Voice by Stefaan van Biesen. Field recordings by Geert Vermeire and Stefaan van Biesen. © Stefaan van Biesen / the Milena principle. The project is one part of a global field recording & sound art work called Cities and Memory, which aims to present and remix the sounds of the world through a global sound map in which every location has two sounds: a documentary field recording and a reimagining of that sound. The project, which has had 220,000 listens in the past 18 months, records both the current reality of a place, and also present its imagined, alternative counterpart – in effect remixing the world, one sound at at time. Every faithful field recording is accompanied by a reworking, a processing or an interpretation that imagines that place and time as somewhere else, somewhere new. The listener can choose to explore locations through their actual sounds, or explore interpretations of what those places could be – or to flip between the two different sound worlds at leisure. There are currently almost 900 sounds featured on the sound map at www.citiesandmemory.com, spread over 40 countries. Cities and Memory has grown rapidly over the past year, with features on The Atlantic, Vice, Slate.com, CBC national radio in Canada, Resonance FM in the UK and specialist sound sites such as Creative Field Recording and the London Sound Survey. The project is completely open to submissions from field recorders, musicians or anyone with an interest in exploring sound worldwide. The field recording and sound art communities have embraced the concept: more than 170 field recordists and sound artists from as far afield as Calcutta, Los Angeles and Cape Town have taken part, providing field recordings and radical reimaginings of global sounds. More’s Utopia explores the society, behaviour, law, customs and culture of the inhabitants of Utopia – a coinage that can be seen to mean both ‘good/ideal place’ and ‘nowhere’. [B_Tour Festival] ⋈ Leipzig Germany 2015. [Ludwig Karl Koch Variations] Sound Research and Workshop. Urban Sounds and Imaginary Spaces / Schauspiel Leipzig - B_Tour_Festival. The artistic use of sound in urban interventions, creates imaginary spaces and conjures heterotopias. Sound has the potential to challenge our everyday perception and inspire new kinds of social choreographies. What is the political potential of sonic practices? How do they change our experience of the city? How can audio-tours facilitate different ways of relating to the urban space? Starting from these questions, current developments of sound art in urban contexts will be discussed. Interventionen in der urbanen Öffentlichkeit erzeugen durch den künstlerischen Einsatz von Klängen und Geräuschen imaginäre Räume und Heterotopien. Sie können unsere alltägliche Wahrnehmung erweitern und zu neuen Formen sozialer Choreographien anregen. Worin liegt das politische Potential dieser Praxis? Wie verändern sie die Erfahrung der städtischen Umgebung? Wie können Audiotouren ermöglichen, den Stadtraum anders zu erleben? Ausgehend von diesen Fragen werden aktuelle Entwicklungen von sound art im urbanen Kontext diskutiert. 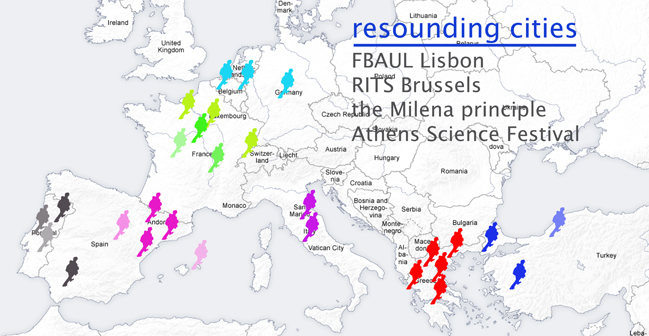 Urban Rituals / Resounding Cities Lisbon - Brussels - Athens 2015. 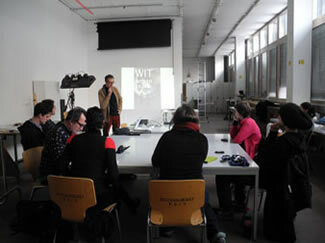 Workshops and walks in Lisbon from March 3d to March 5th. Presentation and exhibition at the Faculty of Fine Arts Lisbon on March 6th. Workshop in Athens on 7th of March at metamatic:taf, walks with noTours and installation during exhibition "Welcome to Ecumenopolis" by METASITU and metamatic:taf. During the Athens Festival of Science - an installation updated the results of the three cities, next to walks with noTours during the exhibition "Arts and Science" 17 - 22 March (curator Christiana Kazakou), concluded with a presentation about noTours and of the process in Brussels, Lisbon and Athens on 22nd of March. Coordination by Geert Vermeire and the Athens workshop team. The project started with the first workshop and sound walk connecting the Katelijne Square in Brussels, the Largo do Carmo in Lisbon and the Monasteraki Square in Athens. A joint project with the Faculty of Fine Arts - University of Lisbon, metasitu:taf in Athens and RITS School of Arts Radio Department in Brussels. In Brussels and Lisbon with Stefaan van Biesen, Geert Vermeire (the Milena principle) and Guy de Bièvre together with Amélie Van Campen, Karen Coppens, Sarah Mylle and Laurens Luyten, next to students of Rogerio Taveira. In Athens with Zoi Arvaniti, Sofia Grigoriadou, Maria Methimaki, Dāna Papachristou, Mariza Parasyri en George Samantas. First workshop and sound walk connecting the Katelijne Square in Brussels, the Largo do Carmo in Lisbon and the Monasteraki Square in Athens. A joint project with the Faculty of Fine Arts - University of Lisbon, metasitu / metamatic:taf in Athens and RITS School of Arts Radio Department in Brussels. A project by the Milena principle (Stefaan van Biesen and Geert Vermeire} together with Zoi Arvaniti, Sofia Grigoriadou, Maria Methimaki, Dāna Papachristou,, Parasyri Mariza, George Samantas in Athens. — met Laurens Luyten, Karen Coppens, Mylle Sarah en Amélie Van Campen bij Sint-Katelijneplein. 06.03.2015. Resounding Cities / Urban Rituals. Presentation of artistic walking projects and sound walking projects in Lisbon. Artwork & wall graphic 'Spaziergangwissenschaft' by Stefaan van Biesen at the Faculty of Fine Arts of the University of Lisbon (curated by Vermeire Geert) and students of RITS School of Arts Brussels -FBAUL Lisbon in the framework of the project Resounding Cities (Lisbon, Brussels, Athens). Building a network of artistic interventions with remote users from other cities we attempt to investigate the effect towards the cities involved. 3 Squares: Largo do Carmo Lisbon, Katelijne Square Brussels, Monasteraki Square Athens. Extracts sound recordings Largo do Carmo by Amélie Van Campen, Sarah Mylle, Karen Coppens and Laurens Luyten. Resounding Cities METAMATICTAF Art and Sience Festival Athens 2015. The collaborative project Resounding Cities uses sound and the sound walking platform noTours as an instrument of transforming experience of urban space, as well as walking, to create urban interventions with locative media connecting various cities in Europe via sound. During the Festival the project is respresented in the Art and Science / Sound Art exhibition (curated by Christiana Kazakou) with an installation – sound map, with noTours sound walks around Gazi and with a public talk. Sofia Grigoriadou (artist), George Samantas (anthropologist), Maria Methimaki (artist – architect), Zoe Arvaniti (theatre studies – artist), Dana Papachristou (musicologist – artist), Mariza Parasiri (engineer – writer), Geert Vermeire (artist - curator), Stefaan Van Biesen (visual artist) / the Milena principle and students of RITS School of Arts Brussels and Faculty of Fine Arts - University Lisbon, next to sound artists and sound designers in various European cities. Tags: sound maps - sound walks, locative media, augmented reality - art work map: Annemie Mestdagh. A Knocking Bird Sint-Niklaas Belgium. A Knocking Bird is an urban and e-culture project with an ecological engagement, organized by Cultuurcentrum Sint-Niklaas Belgium, WIT Urban Team (www.wit-urban.team) and noTours (www.notours.org) in collaboration with the Colour U, several international sound artists and environmental and ecological organizations. Curator: Geert Vermeire. The pilot of this project happens between March and September and invites the residents and visitors of the city to a new urban experience with participation and with locative media. Points of departure are a series of creative meetings with residents and artistic urban interventions by WIT Urban Team, next to an European event with fifteen residents from different European cities to explore nature in the city of Sint-Niklaas during a residency of a week. Their visit will be transformed in artistic results and in personal contributions about nature and city. Symposium Locative Media & Sound Art Buda Fabriek10.05.2014 Kortrijk Belgium 2014. This talk presents a sonic perspective that pays particular attention to the temporal, situated and embodied aspects of locative media. It introduces the concept of ‘Placed Sounds’ for a detailed analysis of locative sound experiences. This framework for analysis considers how locative sound engages with the auditory aspects of our spatial perception and how immersion operates for locative media and sound. Furthermore, it considers the role of situated experience, the role of walking as remixing, and how agency and exclusion operate in locative sound. The concept and this talk draw an extensive archive of examples of locative sound from art, design, education and industry. SPEAKERS & PERFORMERS: Daniel Belasco Rogers (Plan B, UK) / Geert Vermeire (No Tours, BE) / Yvan vander Sanden & Zimcke Van de Staey (Mute, BE) / Séverine Janssens & Flavien Gillié (BNA-BBOT, BE) / Roland Cahen (ENSCI, FR) / Pieter Verstraete (Bilgi University Istanbul / University of Exeter, BE) / Peter Mertens & Harold Schellinx (Stduio ookoi, NL) / Frauke Behrendt (University of Brighton, UK) / Daniel Belasco Rogers (UK). the Listening City Dresden Germany - Athens Greece 2013. To navigate in the urban space, the body guided by streams of sounds, thiswill be our pedestrian banquet, imprintedbetween two conceptual movements about kinetics in the city: promenadology and dromology. The first attitude, the promenadology, introduced in the nineties by Lucius Burckhardt, transformed the drift of the body in the city as a valid scientific and artistic instrument and opposes itself, in our view, to the dromology (a neologism created by Paul Virilio), the science of speed and technology applied to the road. On this way, to establish a semiotics of the city through its sonic profile is predetermined by this two types of civic nomadism : to go on foot or to move by car. But, our artistic gait focusses on walking as an esthetic transgression to neutralize the sonic hostility common to contemporary cities (the noise of traffic) to reconstruct an idiolect sonic architecture of Athens. Steps give a rhythm to this new poetic distribution of sonic ‘solidified’ events in digital partitions, archiving the voice and the memory of the city. In other words walking will be the instrument to capture the sonic urban future as an alternative memory of our phenomological history departing from the euphoric contamination between the fluid plan of sound and the apprehensive dimension of the touch and of the kinesthetic proximity. On this way sound is short-circuiting the spatial extension and emotional intensities are contextualizing the experience of walking in a seductivehabitation of the city : the horizontal nomadism of the urban space becomes a noble experience through a deterritorialization of a vertical nomadism of sound. Athens becomes on this way an esthetic territory that effectsa hedonistic dimension of the aural perception, a city to be surprised in the instable architecture of sound. Moreover, crossingthe city to weave with steps the sonic text of space. This will not be a manner of confirming the urban surface, but most of all of questioning the profound memory of Athens in an « agglomeration » of voices, escaping from the manieristic derision of the visual metropolitan excess. Will this sonic extraction be an implosive reflex for the actual crisis of living the urban spectrum, feeling our exhaustion of living in a mechanic matrix without connection to a somatic flux ? Following the sound of the city with the help of the own body could constitute an epiphany of the voice lost in the night of history of the mysterious owl, symbol of Athens ? Or to rediscover a plasticity of communication with the civic habitation through the emotional porosity of the poetical distributed sound ? The aural experience redefines on an osmotic way the social space as a banquet of emotional transparency, hiding on that way the invisibility of the protagonists of accelerated transit of the technological future. 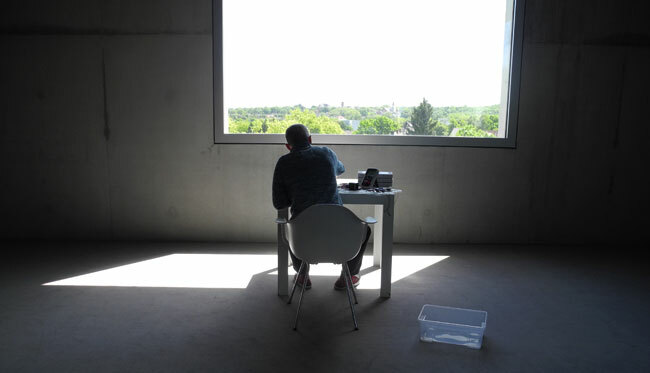 On that way, to connect the own body with the vibration of the sonic idiolects invites an other type of territorial conquest : to capture eu-phonical urban islands in the polyphonic daily environment. The public space will be rethought as an event of sonority, an urbanophonic dimension of the walker confronted with the music of local history, with the idiosyncrasy of the country. The limits of this sonic habitat are configured by the amplitude of the affective event and not by the architectural gestures of a rigid and permanent rational edification. And with this positioning in mind it is not a coincidence that we chose Athens as a city-theater of the cradle of European civilization for this act of « listen in wonder » or contemplating (com-templum), to counteract on this way the panoptikum by which we filter today our urban experience. By consequence the sonic localization of the memory and the tradition of the city of Athens is longing for an experience of negotiation that is equally esthetical as social, a sonic and phonic point that cancels the reciprocal ignorance of the civic anonymity for a social inclusion in the aura of a permutation of various sensorial levels of the body movement in space. On this way the city is becoming a surface of phenomenological imprint of which sound is a discursive register of Athens, an orphic form of corrosion of space in opposition to the grotesque exposition against the technological interference. As a marking image of the project we associate the jeux de mots Urba(n)ear with the deleuzian concept on utopy now-here and no-where, not only by the power of euphonia, but as an intention of signalizing an artistic perspective as the politics of the heart. The Listening City is a sound art project realized by noTours. 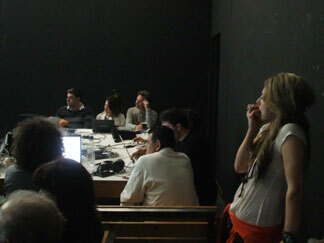 Producer is Goethe Institut Athens. Curated by Geert Vermeire, the project examines over a longer period in 2013-2014 the relationship between residents, the senses, sound and the city in a simultaneous and collective creative process in Athens, Essen and Dresden in collaboration with WIT Urban Team, the Folkwang University of Arts and the University of Thessaly. During the process an international team of sound artists, experts and students in Greece and in Germany will be working on the realization of a sound map of Athens, sound walks in Athens, interactive online tools, videos, soundtracks and texts that will allow people to explore, share and shape the ways everyday sounds influence our perception of city.